We’ve all met them on the course. The classic risk taker who believes that fortune will always favour the brave. Why be a course plodder, always recording a respectable score over the 18 holes, when life is there for the taking, you can imagine them asking anyone who will listen in the clubhouse bar. Well, how about he remembers the 1999 Open at Carnoustie? Yes, yes, Paul Lawrie picked up the trophy, golfing historians will answer. Spot on, but as they always say, no-one remembers the nearly man, and that year it was the Frenchman Jean Van de Velde. He stood on the 18th tee with a three-shot lead; he could afford to make a double-bogey on the final par-4 hole and still win the Open. So what happened? Van de Velde hit a wayward tee-shot into the rough. Given his margin for error, the sensible course was to dig himself out with a wedge. Once back on the fairway, he could plot a reasonable approach to the green and hole out. Job done, winner’s cheque pocketed. Instead, Van de Velde did the one thing he shouldn’t have done. He didn’t play safe. Instead, he picked an iron out of his bag and launched the ball directly towards the green. After hitting a grandstand and the wall of the Barry Burn, the ball proceeded to find some more long grass. From there, Van de Velde found the burn with his next shot and to the delight of the press photographers proceeded to take off his shoes and socks and wade into the water. In the end Van de Velde took seven shots – a triple bogey - and made the three-way play-off that Lawrie subsequently won, but the lesson for our risk taker in the clubhouse was there for all to see: never take liberties with a golf course, and never approach a hole with the aim of getting from tee to green in as straight a line as possible. Rather, carefully think through each stage of that journey. It may not result in you making a dramatic birdie, but it is less likely to result in you making a miserable bogey or worse. Take the example of cross bunkers – those that lie across the face of a fairway. You are standing on the tee, surveying the layout of the hole and the sand traps ahead. Do you possess the technique and the power to hit the ball over those cross bunkers? If the answer is no, then don’t attempt it. 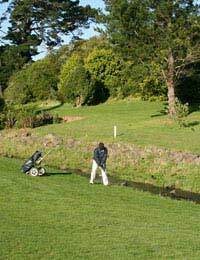 There may be a good chance that your tee shot will fall short of them anyway, and leave you with a good lie. But you could make the sand; you could even force the shot too much in order to inject the extra power and fly off into the rough. The same cautious approach is advisable on and around the green, where a cavalier approach may result in you spoiling all the good approach work and the potential birdie or par that you set up with some skilful use of a wood or iron. When you get in a tricky situation, always err on the side of caution and work on the principle that taking an extra shot to safety is preferable to losing your head and multiplying that extra shot by two or three. And if all else fails, conjure up a mental picture of poor Van de Velde wading in the burn at Carnoustie.